At Coldfall Primary School, we recently adopted the Inspire Maths programme and teachers are working hard to bring the ‘Singapore’ or ‘mastery’ approach into their lessons. But what does teaching for mastery look like in the Singapore classroom? How do teachers use textbooks and how do they ensure that children are appropriately challenged and supported? These were just some of the questions we had as we set out on a trip to the city-state, visiting three primary schools over six days during the Easter break. For our first taste of Singapore school life, we were invited to a whole-school assembly, where some 120 staff and 1,800 children celebrated International Friendship Day. 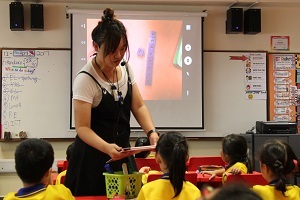 Enormous by comparison with UK schools, this larger size does allow for a greater degree of flexibility with timetabling, and the Singapore Ministry of Education has recently taken advantage of this by encouraging primary schools to move towards a specialist system. Increasingly, children are taught maths by teachers who have chosen to focus on the subject and who have a good perspective on the progression of the curriculum across the different school years. Another striking feature we witnessed was the use of technology. Teachers employed videos, visualisers and tablet devices, not only to show children what to do, but to enable children to share their own work and explain their reasoning. One school operated a ‘Bring Your Own Device’ policy and, at another school, parents could opt for their children to join special ‘iPad’ classes, where almost all teaching and learning was done through the tablet devices. The concrete-pictorial-abstract (CPA) approach was used widely, with children working in pairs or groups using resources such as multilink cubes or play money to investigate challenges set by the teacher. 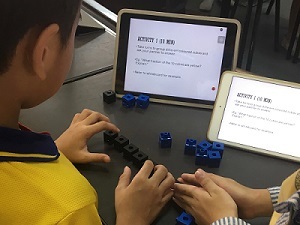 They were then able to take a picture of their work using a device and upload this to the interactive whiteboard, where the teacher could highlight examples of good reasoning or pick up on any misconceptions. Teachers used the textbook scheme as a platform and adapted lessons and materials to meet the needs of their students. Children used practice books for homework and we were struck both by the amount of homework children were expected to complete (up to an hour per subject per day by Year 6), and by the fact that children as young as seven were independently able to record homework in planners, much like those used in British secondary schools. Problem-solving was at the heart of almost all lessons, including in the learning support programmes, where children who show difficulties with formal learning at the very beginning of their first year are taught in small groups in parallel to the main cohort for the first two school years. Polya’s ‘understand, plan, do, and check’ approach to problem solving was followed religiously and, while teachers did use the famous ‘Singapore bar model’, this was just one of several heuristics – a key part of the teacher’s role is to help the children independently select the best method. We returned to Coldfall inspired by many of the lessons we saw and full of ideas about how to help our own children achieve highly in maths. We are also immensely grateful to the schools, teachers and children who invited us into their classrooms and shared their work with us. Rob Bean is a teacher in Peacock Class at Coldfall Primary School in Muswell Hill, where he worked previously as a teaching assistant before joining the Year 4 team. Rob has also worked as a teacher of English as a foreign language in London and in Shanghai. Rob is passionate about finding and sharing new ideas for the classroom, and inspiring children to become lifelong learners.